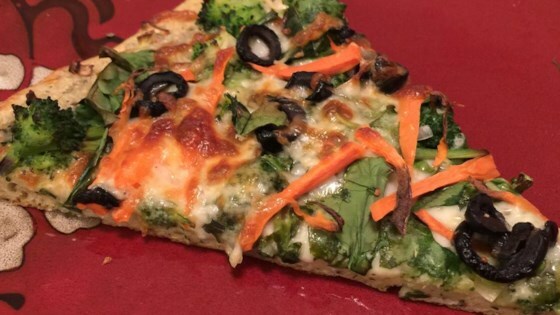 "Delicious and loaded with fresh veggies, this is pizza for people who want a change from tomato sauce. Use any fresh veggies and any pizza crust. Use light dressing and reduced-fat cheese for an even more healthful meal." Place pizza crust on a pizza pan or baking sheet, and spread dressing evenly over the top. Sprinkle with Cheddar cheese, followed by carrots, cauliflower, broccoli, onion, red pepper, and mushrooms. Top with mozzarella cheese. Bake in preheated oven for 15 to 20 minutes, until vegetables are tender, and cheese is melted and lightly browned.